This poem by Kaifi Azmi written in the aftermath of Babri Masjid demolition reveals the contradictions of the movement and is relevant even today. ‘I was born in a slave India,grew up in an Independent India and would like to die in a Socialist India’ was his dream. This dream remains unfulfilled as the present system of inequality is growing very rapidly. 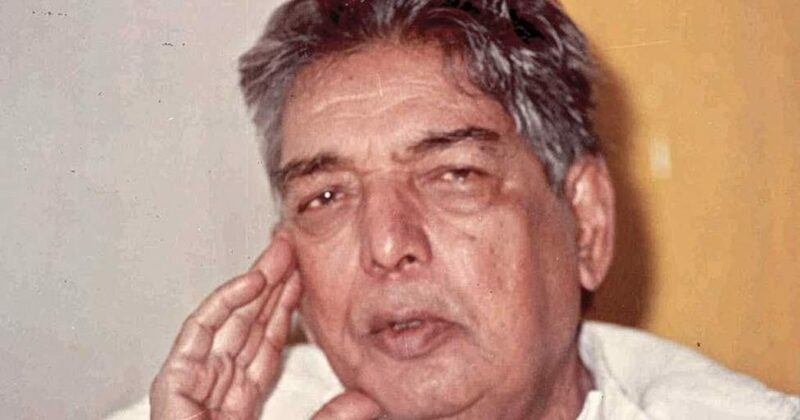 Sayyid Akhtar Hussein Rizvi ( Kaifi Azmi) was born in January 1919 in Mizwaa(n) village of Azamgarh district in U. P. In a deeply religious landlord family. He was sent to a ‘ Madrassa’ in Lucknow for religious education. But he soon developed social consciousness, organized students and held demonstrations. He became ‘comrade’ and not a ‘ moulvi’. He was a man of conviction and never deviated from the ideology. (Kaifi Azmi – a maulvi’ who turned to music and Marx, by Ashutosh Sharma, published 10 May, 2018, nationalheraldindia.com). In his early 20s, he became a member of CPI and had the CPI card in his ‘ kurta’ even at the time of his death. Kaifi wrote fiery poems for the deprived, the disadvantaged, dispossessed, downtrodden and underprivileged. He recited them in poetry congregations. Eminent poet late Nida Fazli in his book ‘Chehre’ writes, ‘ Kaifi’s entire poetic work is the story of those tears in different words”. Being born in a shia family, he mourned for the 72 martyrs of Karbala. After becoming a communist, he mourned for the thousands of sufferers in the world. Nida Fazli mentions in his book that Kaifi’s style of poetry recitation was a part of tradition that he inherited during his childhood in Muharram gatherings. A pioneer in Urdu and Hindi poetry, he could publish only a few collections of his poems: ‘ Jhankar(1943) ,’ Aakhir – e- shab’ (1947) ,’ Awara sijde(1973) and the collected poems Sarmaya(1992) which consist of not more than 125 poems. Many of his writings are uncollected. Despite suffering from cerebral stroke that left him partially paralysed for 25 years, he did not stop writing. He was a master of prose too. He wrote columns in urdu ‘Blitz’ simultaneously published in Hindi between 1964 and 1972 collected in two volumes titled ‘Nayi Gulistan’. Kaifi ( correctly spelt Quifi Azami) was a poet activist and led many strikes and participated in many protest demonstrations. He is a socially and politically committed shaiyirs and belonged to the legendary poets club of Faiz Ahmed Faiz, Sahir Ludhianvi, Maqdoom Moinuddin, etc. His poetry and his politucal activities are inseparable. ( Obituary: An indefatigable poet- activist , by Vishnu Khare frontline.thehindu.com). His poems like Andhi or storm and Bekari ( without a job) depict anger, passion and commitment. In his ‘ Istiqlal or ‘resolve’ , he visualized the dangers of Fascism. His epic poem ‘Aurat’ was so inspirational that Shaukat who was listening to his poem recital at a congregation proposed and made him her life partner. In ‘ Shanti van ke quarib ‘( near shanti van) , he visualizes democracy as a woman riddled with darts. In ‘ jel ke dar par’ ( at the Gate of a Jail) he moving depicts the emotions of two woman and a child visiting their incarcerated bread winner. In ‘Bewa ki khudkushi’ ( the Widow’s suicide) he graphically narrates the tale of a young widow killing herself. To support financially, he wrote lyrics for the films like ‘Buzdil (1951), Kagaz ke phool, Shama, Haqeeqat , Anupama, Pakeeza and Arth, etc. He wrote about 240 songs for 80 movies. For Heer Ranjha, he not only wrote Punjabi- flavoured songs but also entire screenplay in verse. He also did a cameo screen role in Naseem, wrote dialogues for M. S. Satyu classic Garam Hawaan and screen play for Shyam Benegal Manthan’. He was honored with many awards including Sahitya Akademi Award, Padma Shri and for his dialogues in Garam Hawaa, s received Afro – Asian Lotus Award. But his major role in political and social movements and poetry for the masses makes him one of the greats who influenced post independent socialist thinkers and writers.